Tony Marino – composer, pianist, and bandleader has created a loyal following through the years. Formerly known as Havana Heat, Tony continues to define his music with his area’s top musicians, under the new name Latin Jazz Sounds. His first cd “Tony Marino & Havana Heat: The Latin Jazz Project” was released January 1997. The cd debuted original jazz compositions using a variety of Latin styles. Since then Tony has delivered various album releases and now is back with his new album, entitled “101”, which contains 14 original songs using various Latin styles and music arrangements. 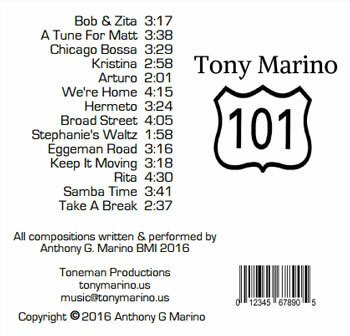 The songs on “101” were written and dedicated to friends, family and mentors that have touched Tony Marino’s life over the years. Tony Marino has lost none of his fire since his ’97 debut release. Combining an approach that draws from the masters of 20th century jazz piano and even younger players, Marino carves out a place for himself that is uniquely his own. “101” is not a big band Latin jazz dance collection. No this a more intimate setting with a core group of players and is without a doubt a great musical experience from a mature master who has blended the beautiful music and rhythms’ of the Cuban, African, American, Brazilian Jazz and the creative groundbreaking Salsa scene. This in my opinion is Tony Marino at his best; most challenged comfortable playing and being inspired by other very talented musicians. In a nutshell this album burns, cooks, is hot, cool, and beautifully rhythmic. Marino’s mastery of the piano reminds me of modern classic greats such as Thelonius Monk, McCoy Tyner and even passionate players like Lyle Mays and Eliane Elias. Listening to this album is like going to that “once in a lifetime” musical event that you always remember for the rest of your life. A quick sampling of the opening track “Bob and Zita” and you will be hooked. If you are still on the fence about buying this album try the second cut “A Tune For Matt”. If these two tunes alone do not have you purchasing the album you may have a hole in your soul. This album swings and is great from front to back. The Latin jazz sound with excellent percussion, swinging arrangements and Marino’s piano bringing it all together and driving it forward, is pretty hard to resist. Try tracks such as, “Arturo”, “We’re Home”, “Broad Street”, “Keep It Moving” and “Rita”, to savor Tony Marino’s diverse timbres and tones. What we have here is a wonderful selection of arrangements with an extremely talented group of musicians. The original songs produced on “101” are overflowing with arousing, spellbinding, colorful and passionate music. It is, in summary, a musical and technical knockout, an absolutely satisfying recording from a fine musician. And yes it’s a must-have album to add to your Latin Jazz collection.